Confederate strategy during the fall of 1862 was dominated by attempts to invade the important Border States for military and political reasons. In the East, Robert E. Lee’s magnificent Army of Northern Virginia entered western Maryland in early September, culminating in the decisive battle at Antietam on September 17, 1862—the bloodiest day of the war. 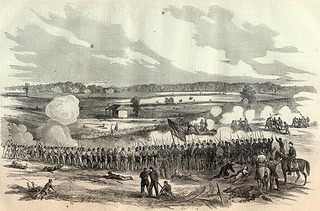 Lee withdrew after an all day slugfest that cost both sides more than 25,000 casualties, but while the Union forces held the field, Army of the Potomac commander George B. McClellan missed a crucial opportunity to cut off Lee and crush his army – and the rebellion. In the West, separate columns under the overall command of Braxton Bragg started heading north into Kentucky in August. By mid-September, Confederate forces held Lexington and Frankfort, controlled a large part of the state and were close to a decisive victory in the west. By early October, Don Carlos Buell’s Army of Ohio had blocked some of the Confederate thrusts and was moving to confront Bragg. Both armies, parched by heat during one of the worst draughts ever recorded and looking desperately for water, maneuvered around Perryville, Kentucky.